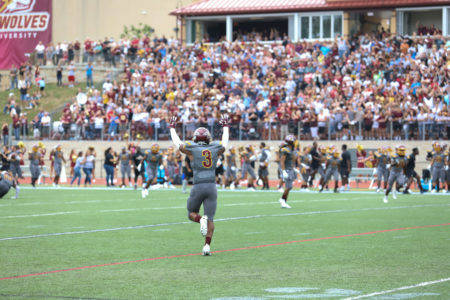 Alvernia Football Camps are dedicated to providing football camps that are both instructional and informative along with creating a great atmosphere to learn! The coaching staff here at Alvernia University prides itself on teaching the game of football to players of all ages and ability levels. The mechanics and drills that are taught at our camps are used with our college players. We are determined to provide the best possible learning experience for our campers. Alvernia Football Camps, along with Millersville University Football would like to welcome you to our 3rd Annual 7 on 7 Tournament! Camp check in will be 30 minutes prior to camp start time. Waivers are to be completed by each participant. A copy for download will be attached to your email confirmation or by clicking here. 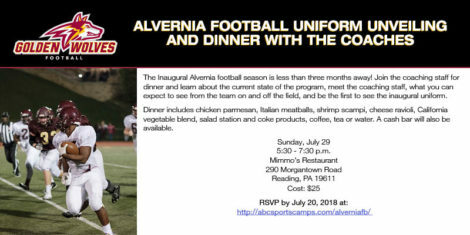 Welcome to Alvernia Football Camps! Waiver is to be completed online, during the registration process. Please review carefully. A night of food, fun, and football. Meet the coaches of the inaugural Golden Wolves staff! Night check in will be 30 minutes prior to start time. Cost per entry is $50 (no limit to the number of entries). For additional entires, simply adjust the number of entires during the checkout process and update your cart. After entering each registrant will receive a number. Framed Jersey with action photo of first game in program history will be auctioned. The winning number will be drawn and announced between third and fourth quarter of the homecoming game October 13th vs. Kings.